As discussed in my previous post, when Quire 13 is returned to its original order,(https://voynichviews.wordpress.com/2015/10/10/voynich-manuscript-re-ordering-the-folios-in-quire-13/), these three folios follow each other. 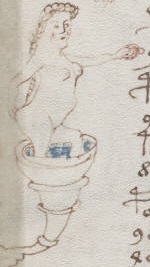 Whatever the motif of the nymph holding the ring may refer to, it appears to be a feature in the “story” that is being told across these three folios, and nowhere else in the manuscript. This is the coat of arms of the Lehwaldt family, from Germany. Though the line is extinct, this is still the coat of arms of the town of Lawalde. The earliest record of this image is 16th century, but the title was granted in the 12th so who knows when they came up with the bejeweled arm(s). To be fair, Miss Lehwaldt isn’t the only heraldic figure to sport an oversized ring like the three nymphs in the VMS. There are also rings being held by hands in various other shields, but I did notice a pattern: All of the shields which feature a hand holding oversized jeweled rings like this are from the same area: a part of Germany known as the Mecklenbourg-Strelitz district, in that intermediate area between Pomerania and Brandebourg. 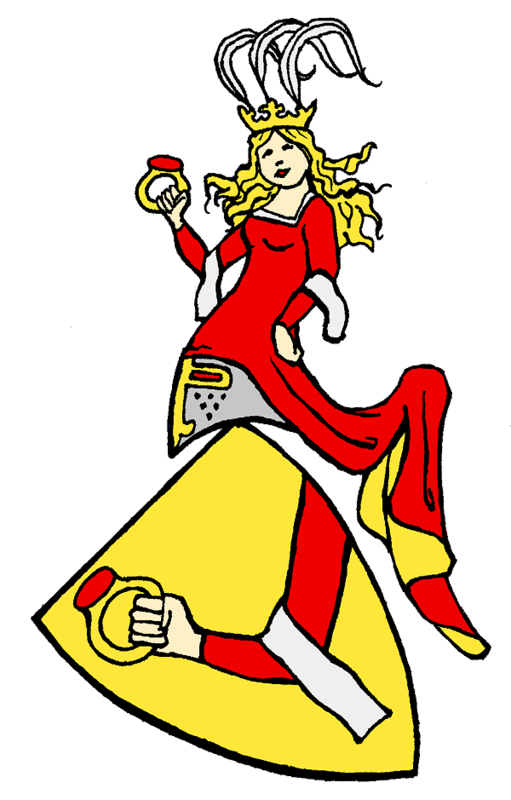 There we also find the arms of the Oertzen family (but the ring is held by two arms), the arms of the Lords of Stargard (as early as the 13th century), those of the town of Furstenberg/Havel and those of the town of Neustrelitz and Strelitz, all featuring the ring being held by a hand. The only exception I’ve found to this localization is a shield of the Royal Lordship of Molina (Spain), which also features an arm holding a ring, but it’s a plain one with no gem. I suppose that there may have been other families who used this motif in the Mecklenburg region, or elsewhere, but unfortunately I haven’t found them yet. This iconographic motif so far seems really very specific to the regions mentioned in this paragraph. It’s not impossible that the three depictions of women holding rings in the balneo section of the VMS are inspired by this rare, very specific heraldic motif. Of course, this makes me wonder if it is meant to represent a person from the Mecklenburg area, or someone whose ancestry has roots there. It could mean something like “Our baths are so great that we have customers who come all the way from Lawalde!” or “Our baths were improved by the additions made by a specialist from Lawalde”, or even “Something unusual happened while we had a visitor from Lawalde”. The fact that the character is represented on three occasions does seem to make “Miss Lehwaldt” a rather important figure in whatever is being discussed here. Of course, there’s always the possibility that the balneo section isn’t about balneo at all, and that the nymphs are symbolic of something else: it could be a political or military plan to invade the Lehwaldt’s lands, or a mention of them as allies, competitors or enemies. There are so many possibilities… and sadly, no, I haven’t got a clue what heraldic symbolism might explain the original appearance of the ring-bearer on these shields. If I had to guess I would say this could be a reference to purity or honor: in the Nibelunglied for example, this parallel between Brunhilde’s ring and her virginity is made explicit. A woman holding a ring is a woman who has retained her virtue. But of course that’s just a guess.